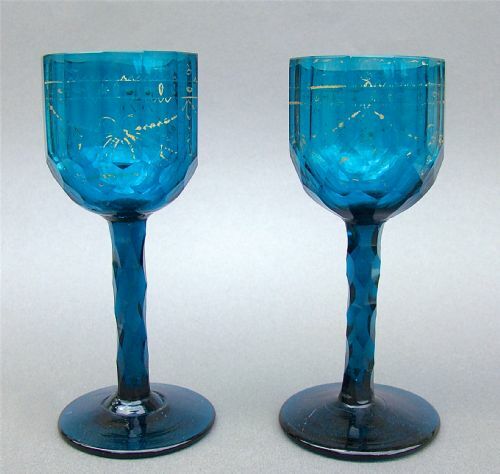 This stunning pair of Georgian peacock blue coloured sliced-cut cordial glasses dates circa 1800. Each faceted bowl sliced-cut with thumb-cut hexagonal patterns and heightened with gilt ribbon-tied decorations. The faceted stem on a wide base with polished pontil.. Height: 15cm / 5.4 inches. Bowl diameter: 5.5cm / 2.2 inches. Postage UK: £11 Special delivery. Postage overseas: from £30.00 standard parcel. This beautiful Bohemian glass overlay glass vase dates circa 1920 . 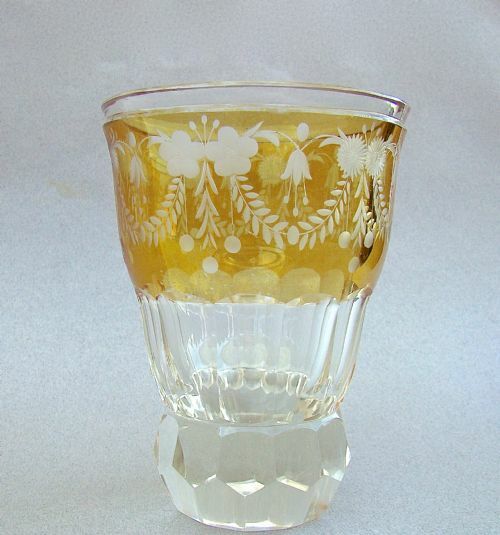 Of baluster form, the amber glass upper section acid-etched with flower garlands. The panelled clear glass raised on a heavy pedestal foot. Height: 13cm / 5.2 inches. Diameter at widest: 10cm / 4 inches. 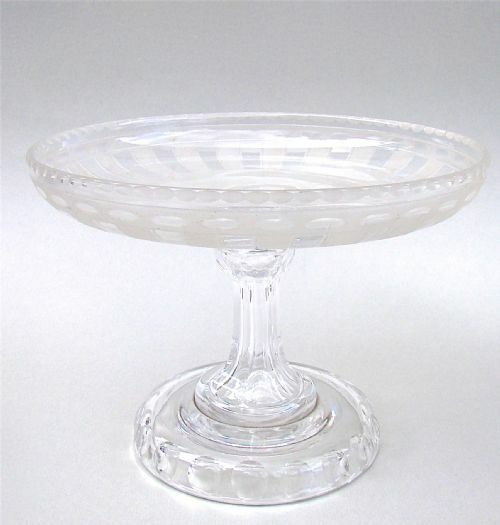 This very elegant Victorian frosted glass tazza has a frosted glass receptacle cut to clear with geometric patterns and is raised on a waisted panel cut hollow stem and hollow cut glass pedestal foot. Height: 13cm / 6 inches. Diameter of bowl: 17cm / 6.2 inches. Diameter of foot: 10cm /4 inches. Postage overseas: from £15.00 standard parcel. 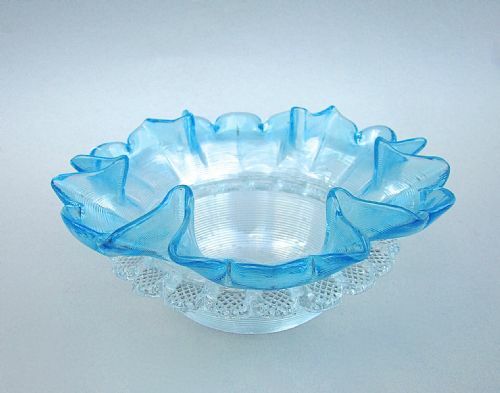 This is a fabulous Victorian vaseline glass sweet meat dish dating circa 1890. The finely ribbed glass body an eye-catching turquoise colour graduating to clear glass. The flared rim with an elaborate pinched border. The centre of the dish applied with a decorative crimped girdle. Smooth pontil mark to the underside. Rim diameter: 14cm /5.4 inches. A few minute flea bite nibs to the ribbed decorations, commensurate with age. 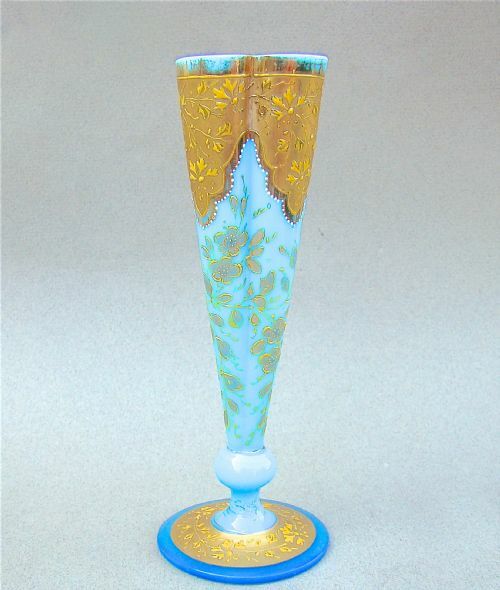 This is a very unusual and decorative Victorian enamelled glass vase. The rich turquoise body decorated with sprigs of white foliage within gilt borders. The wavy rim with traces of gilt. The hollow pedestal foot with snapped pontil mark on the underside. Height: 14cm / 5.4 inches. Base diameter: 11.5cm / 2.6 inches. Rim diameter: 10cm / 4 inches. Postage UK: £8 Special delivery. Postage overseas: £12.00 standard parcel. This is a very decorative Victorian pressed glass water jug , the dark turquoise pressed glass body with hobnail decorations. Star incised to the base. Rim diameter at base: 13cm / 5 inches. Postage overseas: £25.00 standard parcel. 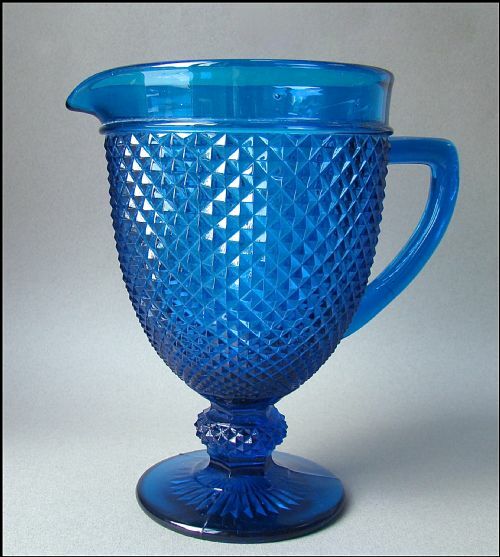 This is a beautiful mid-Victorian glass wine rinser. Rinsers were filled with water and were used by diners to cleanse their wine glasses between courses of a meal. These days they make beautiful rose vases or pot pourri and can equally be used for culinary preparations. The deep turquoise body with an everted rim and central threaded glass girdle. A few trapped air bubbles add to the charm of this hand-blown piece. Smooth pontil mark to the base. Diameter of rim: 12 cm / 5 inches. Diameter of foot: 9.5cm / 3.6 inches. Postage UK: £7 First class. 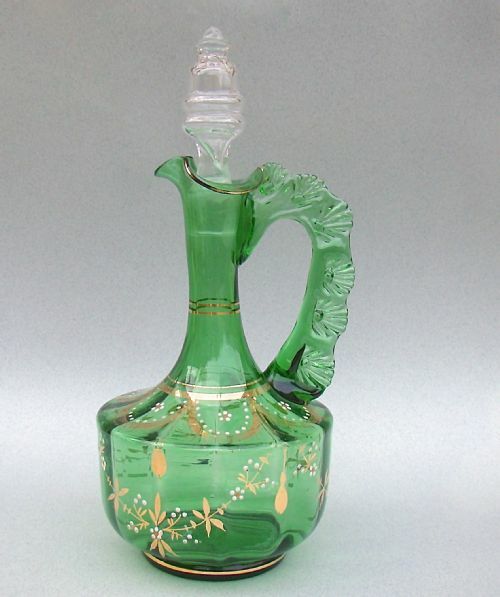 This eye-catching enamelled glass decanter dates circa 1890. The baluster green glass body decorated with sprays of white and orange flowers and heightened with gilt. Very decorative crimped glass handle and wrythen hollow stopper. Diameter at widest: 12cm / 5 inches. Postage UK: £7 Recorded Delivery 1st class. 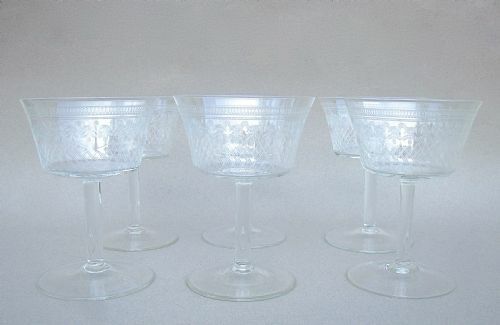 This is an elegant set of six Art Deco champagne Pall Mall glasses. Each flared bowl wheel engraved with a scroll work border, above garlands of flowers and lattice decorations. Raised on a straight stem. Height: 11cm / 4.3 inches. 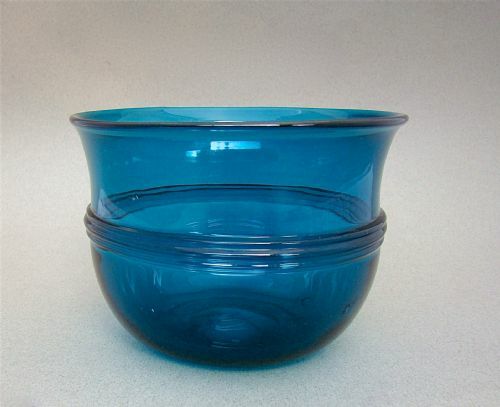 Diameter of bowl: 8cm / 3.2 inches. 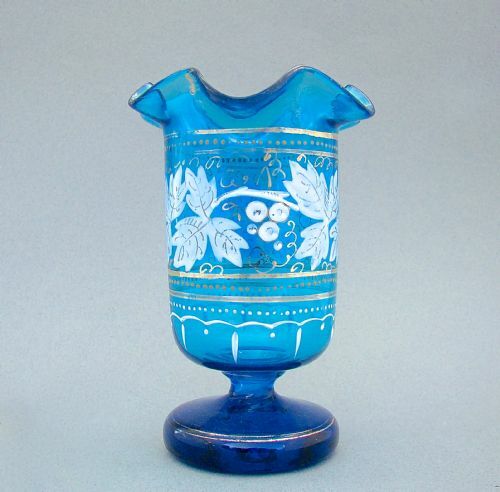 This delightful small enamelled glass turquoise opaline specimen vase circa 1890. The turquoise conical body heightened with gilt floral trailing decorations and gilt bands. Quatrefoil shaped rim and circular pedestal base with conforming gilt decorations. Height: 15cm / 5.6 inches. Base diameter: 5.5cm / 2 inches. Gilt decorations in good condition, just minor rubbing on rim, commensurate with age. 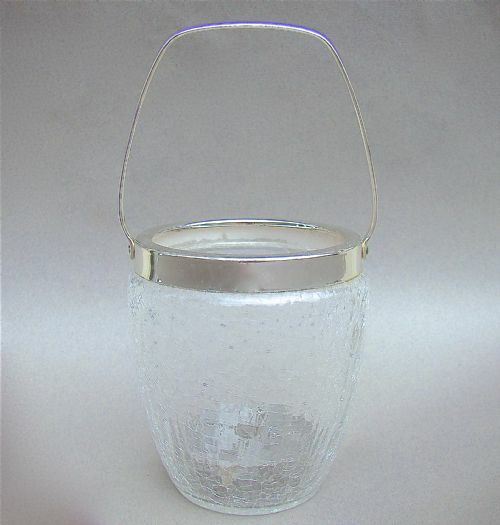 This is a stylish Art Deco small table ice bucket. The crackle glass body mounted with a silver plated neck and handle. The base with removable sieve. Height up to rim: 12cm /5 inches. 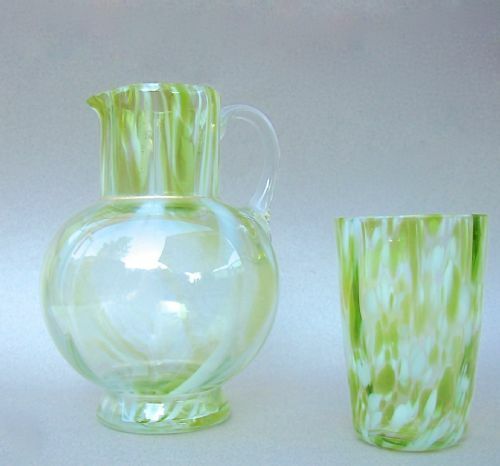 This exquisite Victorian duo comprises of a water jug and glass beaker. The mottled glass an eye-catching white opaline and lime green colour. The baluster jug with clear glass handle and gilt border. Height: 16cm / 6 inches. Height: 8.8cm / 3.4 inches. Postage UK: £6 Recorded Delivery 1st class.